Listen to the Holiday Harp! Click recorder above to play "Carol of the Bells"
I call my studio in Ellicott City, MD "Harpfolk." The Celtic harp is a traditional folk instrument. "Harpfolk" is also the folk who gather here - my students and friends who love harp music. 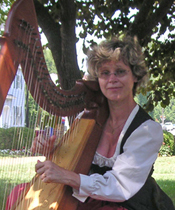 I play the Double and Single Celtic Harps, performing at weddings, parties, and events along the East Coast. I perform outdoors in area festivals. I have been featured at the Scottish festival at Ward Park in Alexandria, VA, and the Delta-Cardiff heritage festival in Delta, PA. I perform as a solo artisit and with my friend and colleague, Mary Ellis, on the recorder. If requested, I can accompany vocalists or other artists. My repertoire encompasses classical, traditional, ethnic, and modern music. I give private instruction to students of all ages and abilities at my studio in Ellicott City, MD. Each student receives an individualized curriculum, 3 lessons per month, harp rental, and a yearly CD of their work. Our annual CD recording is a fun project that demonstrates student progress and helps develop critical listening. ... have traveled as far south as Patagonia, Argentina, where in 2000, I played at the elementary and high schools, inns, and chapel. 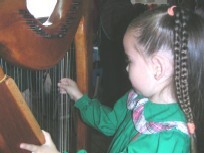 I returned in 2004 to donate a custom-made harp to the children of the small remote town of Gaiman, appearing on local television.